The YJ Trail Runner System is perfect for those looking to get the most out of your Wrangler. The wheelbase is stretched to 102 Inch. This is accomplished by an approximate 2 Inch front stretch and 6 Inch rear stretch greatly improving approach and departure angles. 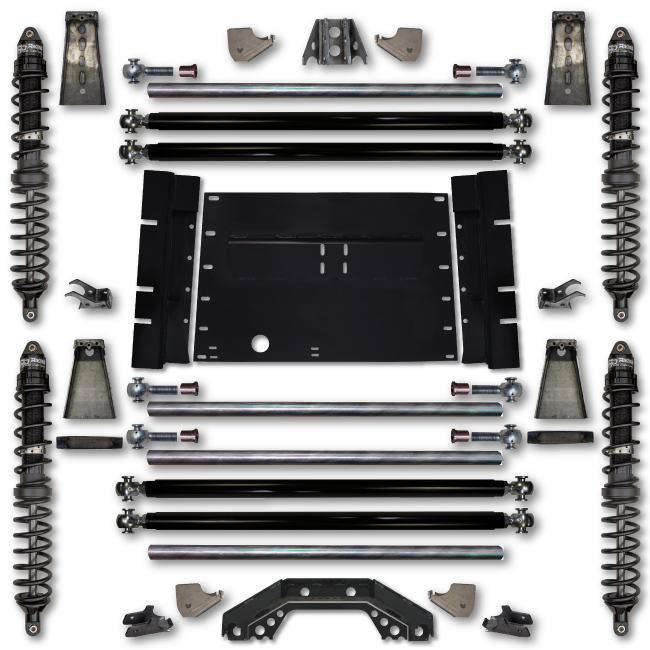 This wheel base, combined with the multi link design and tuned coilovers, makes your YJ great for just about all off-road conditions as well as street use. The sport tuned 14 Inch travel front and rear 2 5/8 RRD Racing Coilovers provide great on road ride and off-road performance. Like all of our RRD products, they are full adjustable and tunable. The rear coil overs are frenched into the frame ahead of the axle enhancing the off-road ability even further, much like an off-road race vehicle! The approximate lift height supplied is 4.5 Inch over stock and is adjustable of course. Please make sure to review the requirements for the system and proper fitment before purchasing in the notes below. Requires minimum of 65 WMS (JK width) with 3.5 inch backspace wheels or minimum of 67 WMS with 4.5 inch backspace wheels. Requires a SYE with C.V. driveshaft. With long rear uppers, a custom cat back exhaust is required. Hydraulic bump stops and limit straps recommended. Long travel sway bars are recommended for at least the rear. Requires rear fuel tank conversion such as Gen Right Comp Tank. Flat fenders or high line conversion recommended up front. Stretch corners recommended for the rear. Requires and engine hoop support be fabbed to support front coil over mounts side to side after installation. Fabrication skills and suspension setup knowledge required.